Follow these simple steps. It should only take 10 minutes, then you can relax and watch your little friend enjoy the tasty hamster salad! If you don't have all the ingredients then just use some of them, it's still yummy! And instead of olive oil or sunflower oil you could go with lemon juice or apple juice or anything. I just hope you and your hamster enjoy it! Step 1. Get a bowl and get all the ingredients together and a knife to cut them up. Step 2. Get a small amount of lettuce and cabbage and slice up into little pieces so your hamster does not choke and add them to the bowl. Step 3. Add apple or pear slices and very small tomato pieces to the bowl. Step 4. Add celery slices and carrot slices to the bowl. Step 5. Add banana slices to the bowl but cut them into little pieces, not circles. Step 6. Add cucumber slices to the bowl and then cover the mixture with sunflower seeds and broken up crackers. Step 7. Add sunflower oil or olive oil to the mixture 3~4 drops and then add a drop of water. Step 8. Mix it all up and stir when you are done empty the mixture into a small tub or something or the hamsters food bowl and let it enjoy and remember to have fun! To be fair i was like 10 or 11 years old when i made this, on this website! what do you mean your hamster passed away ? 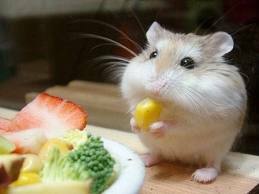 if it did im sorry but why are you on hamster recipe websites ?